2015 Community Police Academy The Buena Park Police Department is proud to announce the upcoming Community Academy commencing this fall! The Buena Park Police Department is proud to announce its Community Police Academy fall 2015. The Community Police Academy was created to educate the public regarding police department operations and to provide an opportunity for participants to meet the men and women who provide law enforcement services in their community. The Community Police Academy’s curriculum is designed to provide an inside look at various operations, such as: patrol, traffic, vice and narcotics, gang suppression, robbery and homicide investigations, property and evidence, as well as forensics. Participants of the Community Police Academy receive demonstrations by the Canine Unit, firearms instructors, and the SWAT Team. 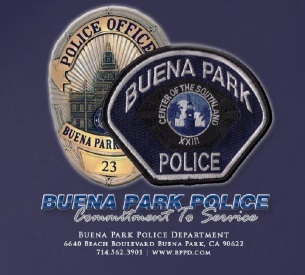 The Buena Park Police Community Academy will take place at the Buena Park Police Department on three consecutive Saturdays from 9 a.m. to 4:30 p.m. commencing Saturday, September 12, 2015. Please click on the flyer below for further information and course application.